Exome mining. Trio exome sequencing is both easy and difficult at the same time. If you manage to identify a plausible de novo mutation, the job is pretty much done. However, if no plausible de novo is found, things can become complex very quickly. Some of the known genes for recessive disorders are quite variable and therefore difficult to interpret. Also, we know little about the overall spectrum of the recessive disorders and the plausibility of atypical cases. A recent paper in Clinical Genetics takes a comprehensive approach to the genetic basis of pediatric epilepsies by exome sequencing. The authors include the analysis of recessive and compound heterozygous variants, and they follow up on some of the biomarkers that establish the diagnosis. There are some surprising findings. The study. Dyment and collaborators investigate eight families from the Canadian FORGE and Care4Rare consortia. They perform exome sequencing in the families, mine exome data for de novo , compound het, and recessive variants and aim to present additional independent evidence that some of the genes implicated by them are in fact causative. They are following the interesting concept of dividing the gene findings into known genes with known phenotypes and known genes with unknown phenotypes. It is the latter of both combinations that is of particular interest. Dyment and collaborators provide evidence that atypical presentations might be as possible as the classical cases. Let’s review a few of the families they solved with exomes. Three families with mutations in SCN8A, SYNGAP1, and KCNQ2 won’t be discussed in detail in this post, as the phenotypes were typical. Study by Dyment and collaborators, which aims to assess the genetic basis in 8 families with presumably genetic epilepsies. GRIN2A. Dyment and collaborators identify two families with de novo GRIN2A mutations. One patient had Landau-Kleffner-Syndrome, a known phenotype within the GRIN2A spectrum. The second patient, however, had an onset of refractory complex partial seizures, tonic seizures, and atypical absences with frontally predominant epileptiform discharges. These findings were felt not be within the range of seizures and electrographic features typically seen in epilepsy-aphasia syndromes. Also, the patient had some dysmorphic features, which is usually not seen in patients with GRIN2A mutations. The second example suggests that the spectrum of GRIN2A-associated epilepsies may be wider than we would usually think and that GRIN2A is one of the genes that you basically stumble upon by exome sequencing in patients with non-specific epilepsy phenotypes. FOLR1. The authors identified two siblings with mutations in FOLR1, coding for folate receptor 1. Recessive mutations in this gene are known to cause neurodegeneration due to cerebral folate deficiency, a potentially treatable neurometabolic disorder. The siblings were included when in their 30s and had long-standing intractable epilepsy and intellectual disability. Unfortunately, the type of epilepsy is not detailed in the publication by Dyment and collaborators. The authors could show that both siblings had very low levels of methyltetrahydrofolate in the CSF, confirming the molecular diagnosis. Also, the MRI scan suggested an underlying neurometabolic disease. Neurodegeneration due to cerebral folate deficiency is potentially treatable through administration of folinic acid. It is interesting to note that this condition may masquerade as intractable epilepsy. ASAH1. A 15 year old girl with progressive myoclonus epilepsy was found to have a compound heterozygous mutation in ASAH1. Mutations in ASAH1 are known to cause spinal muscular atrophy with progressive myoclonus epilepsy (SMA-PME). The patient eventually showed features of spinal muscular atrophy, but this was only in later stages. Initially, she presented with myoclonic and atonic seizures with generalized spike-wave starting at the age of 10 years. The initial presentation might have been compatible with an Idiopathic/Genetic Generalized Epilepsy (IGE/GGE). Acid ceramidase activity was decreased consistent with a functional effect of the enzymatic activity. However, the activity was higher than usually seen in SMA-PME, suggesting that the patient had a milder form that presented as a non-lesional epilepsy. SYNJ1. Mutations in the gene coding for synaptojanin 1 are known to cause early-onset Parkinson’s disease (PARK20). A homozygous mutation in SYNJ1 was found in a patient with intractable epilepsy starting in the neonatal period with recurrent status epilepticus, tonic seizures, and profound developmental delay. The MRI showed generalized cortical atrophy and the patient was reported to have modified hypsarrhythmia at some point during the course of the disease. The patient died at the age of 6 years and brain autopsy was performed, which showed the neurofibrillary tangles and tau in the substantia nigra. The mutation in SYNJ1 is only case in the study by Dyment and collaborators that I wanted to raise some concern about. First, the correlation of tangles and tau is not a clear cause for the neonatal onset epileptic encephalopathy in this patient. Also, SYNJ1 is a relatively variable gene, which may accumulate rare variants unrelated to the disease. It might be worthwhile looking at the full exome data including de novo mutations in this patient to see whether there are other candidates that are more promising. Summary. The study by Dyment and collaborators is an interesting example of how a comprehensive evaluation of exome data combined with additional biomarkers can help us make sense of genomic data. The patient cohort by Dyment and collaborators is highly selected and the success rate of 7/8 families (6/8 when excluding the SYNJ1 mutation) might be an overestimate. Other studies suggest that exome may help a final diagnosis in ~30% of patients. In addition, it is interesting to observe how we slowly develop a good understanding of how to deal atypical presentations of known genetic epilepsies. With additional atypical presentations identified, I would expect that our current understanding of phenotypic boundaries will change dramatically over the next few years. 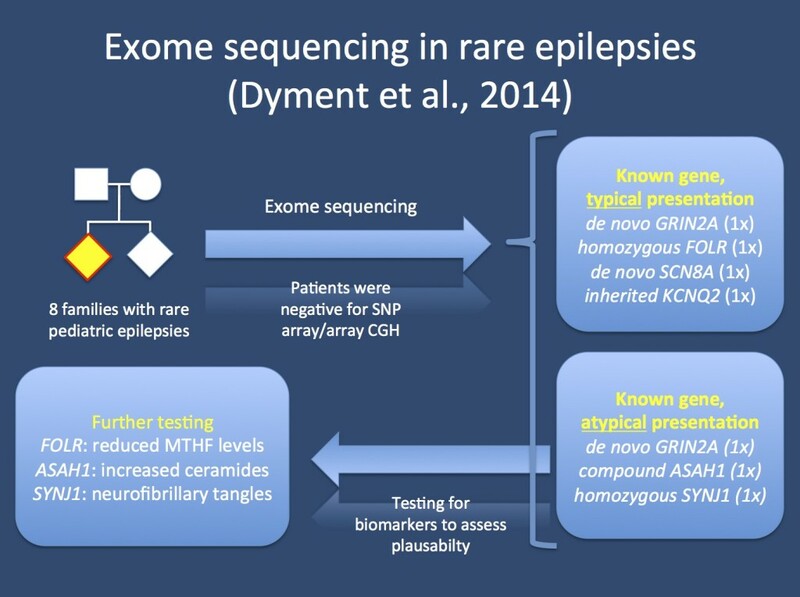 This entry was posted in 2014, Epileptic encephalopathy, Familial epilepsies, Papers and tagged Care4Rare, diagnostic exome analysis, familial epilepsy, FOLR1, FORGE, KCNQ2, KCNQ3, recessive analysis, SCN1A, SCN8A, SYNJ1. Bookmark the permalink.